More than any other state, Hawaii stands out when it comes to its racial and ethnic diversity. The Rainbow State has never had a white majority. In fact, non-Hispanic whites, the largest group in most states, account for only 23% of the population, according to 2013 census figures. Asians, a category that includes Chinese, Japanese, Korean, Thai and Filipino immigrants whose ancestors once worked on the islands’ sugar cane and pineapple fields, are collectively the largest group at 37%. The author, David Swanson of the University of California, Riverside, presented his new estimate of the “pre-contact” population at the University of Hawaii in February. Swanson used an approach called “backcasting” to reach his historical estimate of the Hawaiians’ population decline. It’s essentially the reverse of what demographers more commonly do: forecasting population growth. In this case, Swanson took a detailed look at the 1910 and 1920 U.S. Census’s Native Hawaiian counts, tracking the survival rate of each five-year age group from one census to the next. For example, he looked at how many children who were newborns to age 4 in 1910 were counted as 10- to 14-year-olds in 1920, then did the same for each successive age group. For each group, he created a “reverse cohort change ratio,” which he used to go back in time and estimate the size of each age group for each decade until he got to 1770. Swanson’s estimates show that the death rate among Native Hawaiians accelerated devastatingly fast after their first contact with Western foreigners. Captain Cook and his crew wrote in well-documented accounts about concerns that they had infected the population with venereal diseases (Cook said he unsuccessfully tried to prevent his men from mingling with the native women). Over the years, many other infectious diseases and illnesses such as measles, chicken pox, polio and tuberculosis killed thousands of Hawaiians. By Swanson’s estimates, 1-in-17 Native Hawaiians had died within two years of Cook’s arrival. By 1800, the population had declined by 48% since Cook set foot on Hawaii. By 1820, it had declined 71%; by 1840, it declined 84%. Swanson’s estimates have some caveats. In an interview, he said that the figures do not account for Native Hawaiians who may have moved off the island, including some men who joined whaling vessels during the 1800s or left for the mainland U.S. or other parts abroad. But he reasons these figures are small. He also cautions that his data are based on the U.S. Census data, which might be inaccurate. Swanson’s paper acknowledges that these figures are not likely to end the debate over the pre-contact Hawaiian population. “It is not likely that any estimate, no matter how transparent and methodologically sound, will ever satisfy all parties,” he wrote. Even so, historians and demographers agree that the devastation of the population was swift and dramatic. Historical accounts by missionaries and other Westerners who first arrived in the 1820s frequently predicted the complete eradication of the Hawaiian race from the planet by the early 20th century. Indeed, by 1920, the Native Hawaiian population had dwindled to just under 24,000, according to the U.S. Census. But there’s a turnaround to this story. For the past several decades, since the 1980s, the Native Hawaiian population in the state and across the country has been surging, and growth is projected to continue. The state’s Native Hawaiian population, which includes people who are of more than one race, stands at 298,000. Nationwide, there are more than 560,000 Americans who claim Native Hawaiian race, according to 2013 census estimates. One possible reason for the growth may be in how people of Native Hawaiian descent are counted. Although the population grew steadily in the latter half of the 20th century, the numbers accelerated in 2000 when the Census Bureau began allowing people to select more than one race to identify themselves. Among the U.S. 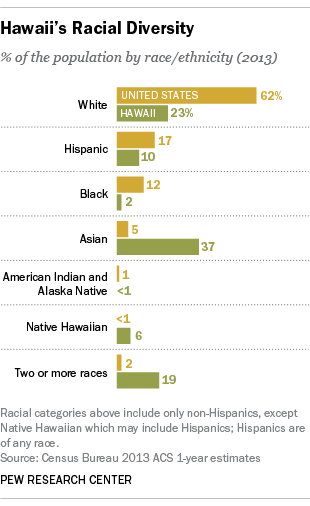 Native Hawaiian population today, 36% identify as two races and 26% identify as three races; only a third – 33% – identify as only Native Hawaiians. The total Native Hawaiian population in the state is projected to reach more than half a million by 2045 and more than 675,000 by 2060, according to a 2012 report by Kamehameha Schools. Their numbers are in sync with state estimates, which were published in 2010. 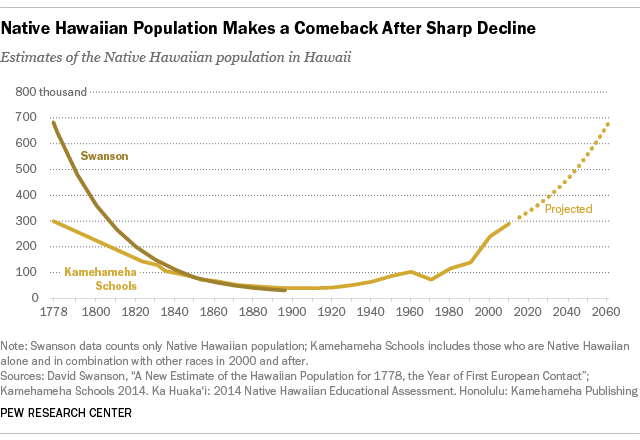 It’s rare to see such a U-shaped curve for a small population like Native Hawaiians to make a comeback – in this case, at numbers not seen since 1778. But just when Hawaii reaches that point (or whether it has already) depends on which numbers you use from the start.